Buy Online Now! 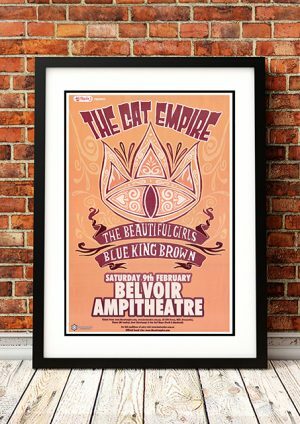 – Blue King Brown Rock Concert Posters and Memorabilia. Blue King Brown are an Australian urban roots ensemble formed in 2003 in Byron Bay by mainstays Nattali Rize and Carlo Santone. They have released three studio albums, Stand Up (October 2006), Worldwize Part 1 – North & South (August 2010) – which reached the ARIA Albums Chart top 50 – and Born Free (November 2014). They have toured nationally and internationally; and supported concerts by Carlos Santana, Michael Franti & Spearhead, Damian Marley, the John Butler Trio, the Cat Empire, Silverchair, Dispatch and Powderfinger. We stock an awesome Poster featuring the Cat Empire, Beautiful Girls and Blue King Brown from 2008.